Evil Dead News - News Related To The Evil Dead Franchise: EvilDeadWorkshed.com will be at Wizard World Chicago on Saturday August 20th and Sunday August 21st! EvilDeadWorkshed.com will be at Wizard World Chicago on Saturday August 20th and Sunday August 21st! 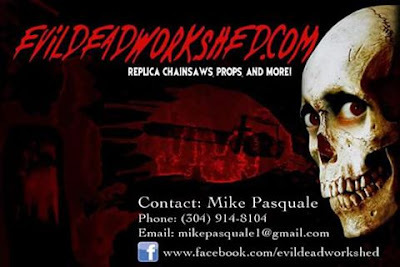 I am excited to announce that EvilDeadWorkshed.com will be at Wizard World Chicago on Saturday August 20th and Sunday August 21st! I will have the Workshed from Evil Dead 2 on display! I am also bringing a prototype of the Evil Dead clock on display as well as my Chainsaw replicas as well as other items from the Cabin. I will be taking preorders at the show for chainsaws and clocks and will be raffling off a Witch Carver Chainsaw prop.